Kokawa Temple (粉河寺) is one of the most popular temples in Wakayama Prefecture. It is located in Kinokawa, Wakayama. It was established in 770 and has been highly respected temple. Kokawa Temple is the 3rd temple of 33 famous temples of western Japan. There are many old buildings that are over 200 years old. You can see the great architectures of Edo period. Also, the dry rock style garden was built in late Momoyama period (late 16th century). It has a dynamic art design of Momoyama Period. Kokawa Temple is Tendai Buddhism Temple located in Kinokawa, Wakayam Prefecture. It was established in 770 by Ohtomonokujiko. It's been already flourished around Heian Period. 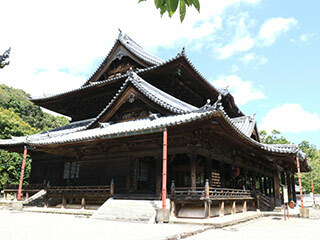 After that, Kokawa temple was considered as one of 33 important temples and it is registered as the 3rd temple. During the Sengoku period (around 16th century), this temple became so powerful with monk warriors. However, in 1585, Toyotomi Hideyoshi attacked around this area and many of the building were lost in this war. Today's many remaining buildings were constructed in Edo period. Daimon of the temple measures 12.48m width and 7.48m in depth. We don't know for sure when it was constructed, but judging from the inscription 1707 found in one of the gargoyles, it is estimated that this gate was built somewhere around that time. Made of zelkova wood and well preserved, Daimon is among the most important structures remaining from the middle of the Edo period. The Hondo of Kokawadera is a typical example of the temple architecture that characterizes the mid-Edo period. The original temple was built here in 770, the first year of Hoki in the Nara period, the existing building was constructed in 1720. Kokawa temple is generally known as the 3rd and the greatest amulet-issuing-temple and has long attracted people going on pilgrimages to the famous temples throughout the western part of Japan. In the Naijin (the sanctuary or the inner chamber) of the Hondo is the Senju-sengen-Kannon (the Goddess of mercy with a thousand hands and a thousand eyes). It is kept deep inside a small temple called "Zushi." On either side of the Kannon stand her Niju-hachi-bushu. The Gejin and Chujin of the Hondo are 33.08m wide and 12.12m deep, while the Naijin is 23.93m width and 13.03m in depth. Placing Shitenno, 4 divine gods of warriors. Constructed in 1832. Built in late Momoyama Period(late 16th century). It has a feature of the dynamic art of Momoyama Period. It was made from huge rocks with powerful representations.